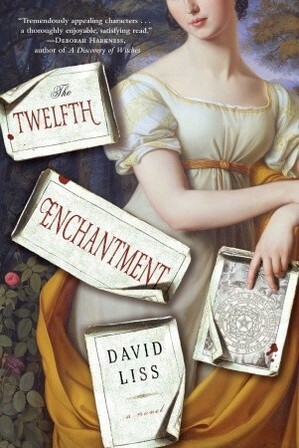 The Twelfth Enchantment, the newest novel by David Liss, author of A Conspiracy of Paper and others, could inspire an amazing collection. That was the thought that kept occurring to me throughout this enjoyable but flimsy story. The setting and the premise are interesting. It’s England in 1812, and young Lucy Derrick is almost without a friend in the world, and she’s being forced into marriage. That is until she learns how to cast magic spells from a neighbor who is--not to spoil the story--an otherworldly being. The Luddites are just beginning their uprising against industrialization, and Lucy gets swept up into an implausible good versus evil narrative in which she must save England from Luddites and the Undead by finding a magical book--“There is no book on earth so dangerous as the Mutus Liber. It secrets are devastating.” All the while Lucy, a strong heroine, must preserve her heart and her virtue from the rakish Lord Byron. He plays a major role in the novel, which at first seems promising, but rather quickly dissolves into thin fantasy. William Blake also pops into the narrative a few times. One character's proclamation--"No one wants to spend her days and nights buried in dusty old tomes"--notwithstanding, I kept imagining how the people and events in this novel would make a very cool collection. It could include manuscript and printed material on women's history in England at the time and on the Luddite movement. Contemporary books on conjuring, magic spells, and "cunning women" would be necessary. A first edition of Byron's book of poetry, Childe Harold's Pilgrimage, which features in the storyline, would be a high point of the collection, and we would have to add some William Blake illustrations, particularly those with supernatural themes. Building this fictional collection based on a novel is an odd thing to consider, but Liss drove the plot so hard that what began as an intriguing historical novel failed to deliver the intricate details and nuances associated with great historical fiction, and I found my mind wandering. The setting and the premise are interesting. It's England in 1812, and young Lucy Derrick is almost without a friend in the world, and she's being forced into marriage. That is until she learns how to cast magic spells from a neighbor who is--not to spoil the story--an otherworldly being. The Luddites are just beginning their uprising against industrialization, and Lucy gets swept up into an implausible good versus evil narrative in which she must save England from Luddites and the Undead by finding a magical book--"There is no book on earth so dangerous as the Mutus Liber. It secrets are devastating." All the while Lucy, a strong heroine, must preserve her heart and her virtue from the rakish Lord Byron. He plays a major role in the novel, which at first seems promising, but rather quickly dissolves into thin fantasy. William Blake also pops into the narrative a few times.